Walking is often described as "controlled falling". Because humans are the only mammal to stand erect, we have to maintain balance and equilibrium within our tall, straight and largely unstable body structure. In comparison to our height, our feet are very small, holding us upright against gravity, moving us forward, side-to-side and backwards. To help stablise our movement, walking requires us to have one foot on the ground for approximately 60% of the time. Sight, balance and sensation must communicate together, to achieve what we tend to regard as a simple movement. As many of you know, we don't walk very well, at all. We move our legs, but don't generally engage the torso. It is not until you experience Nordic Walking that you become aware of the flaws in this basic form of locomotion. The torso movement is critical to ensure that our lower joints are not overloaded with our body weight and to maintain flexibility within the spinal structures. 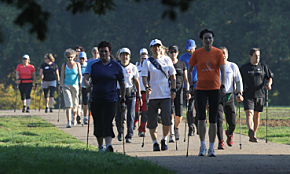 Nordic Walking provides improved stability and torso activation. The pole plant, along with the heel-toe gait, provides a stable triangular base for the carriage of the body (as seen in the photo of the woman). As we head in to the warmer months, everyone's activity starts to take on a renewed focus. Join us for this Nordic Walking refresher workshop. Reconnect and review your Nordic Walking technique to ensure you are getting the best out of your body. Ever wondered what those poles were all about and how they work? Do you have friends who would like to give-it-a-go? 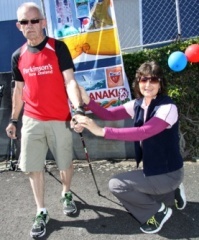 This is the perfect opportunity to try Nordic Walking on one of Waiheke's best beaches. All poles supplied. For the past three years, there has been an enormous amount of scrutiny around the food pyramid and its devastating effects on obesity and health. 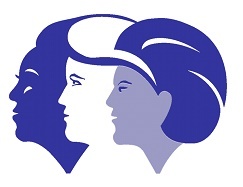 49,000 woman participated in an 8 year "low-fat, high-starch diet" (as recommended by the USDA food pyramid). The "Women's Health Initiative Dietary Modification Trial" showed that this diet was 'inadequate for weight loss or prevention of heart disease or some cancers' (Havard School of Public Health). Throughout many countries, there has been a ground-swell of change, as consumers become better informed. In many cases, scientific research has been shown to have been manipulated and contrary research simply not published. "Dieting" can be a dreaded word in our vocabulary, evoking thoughts and actions of strict discipline, denial and often failure. There is increasing evidence to suggest that the dietary recommendations of the past 50 years have set us up to fail. Not only has obesity increased, but also the preventable disease, Type II diabetes. As we need to eat for our survival, making long-lasting dietary changes can challenge us. The first step in successful change begins with an understanding of how different foods react within the body, especially those foods which are addictive, causing us to eat more and more. Are you struggling with your own weight control? How often do you eat during the day because you are not feeling satiated? Do you have more fat around your tummy than you would like? Are we living in a society that expects to have health problems as we age? "The Achilles' Heel of Successful Weight Management"